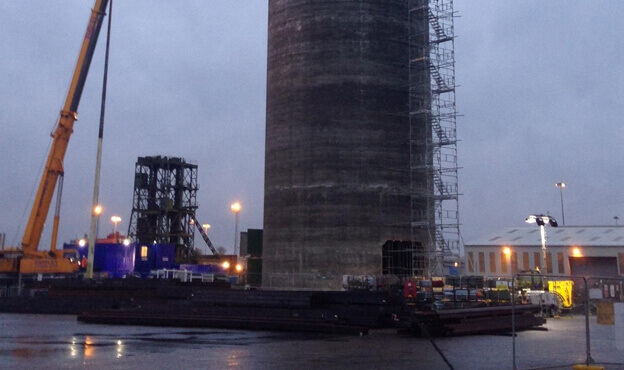 A 14m diameter, 46m high slip formed reinforced concrete bulk load out silo on the Goole docks, the silo was required to store four different types of material; white cement, grey cement, fly ash or ground granulated blast furnace slag. The project was designed to allow Damac to expand their East Yorkshire operations by increasing the capacity and flexibility of the terminal. Spencer Group undertook the site management, piling, foundations, staircase, hand railing and roofing works on the site, all the way from design to delivery. The works included both innovative slip forming work and traditional civil engineering work to create a facility that is both innovative, and fit for purpose. 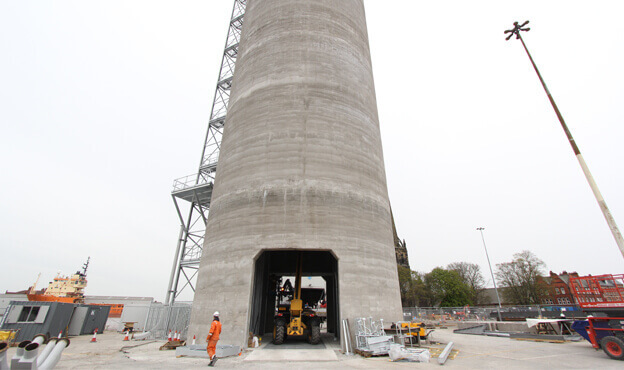 Spencer constructed a slip formed Silo body with 4500m3 of storage and a sloping floor with clearance to the underside of 7150 mm, the associated supporting walls, columns and piled foundations, provision for an 18m x 3m weighbridge , access for single direction HGV passing through the silo, a steel access stair to the roof providing access to the silo interior above the silo floor, and a stair providing support for the cement blow pipes. Spencer Group completed the project to facilitate Damac’s expansion of their East Yorkshire terminal. The expansion will allow them to load more quickly, increasing operational efficiency whilst also raising capacity and flexibility for the terminal. The design work was carried out with speed in mind and facilitated by the innovative Slipform Engineering Team, due to significant time demands by the client, who were keen to minimise downtime on the site and its associated costs. 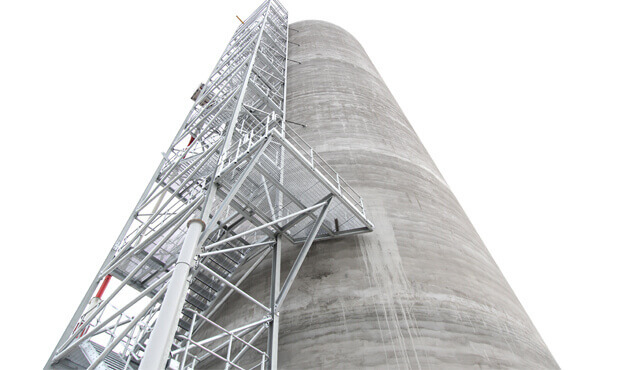 Due to this, the silo was built within eight days, enabled by the rapid deployment of a system which is significantly faster than traditional slip forming techniques.